Explore possibilities for your space and the John Mini experience. 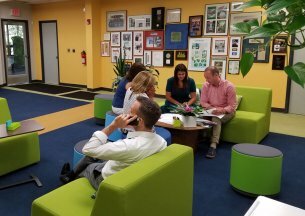 John Mini Account Manager, Bobby Bandura, shares his role in improving office environments with plants. Passion inspires our work. Expertise sustains it. Scott Ahlborn, Sales and Design, describes what a client can expect when they partner with John Mini. Retreat from the hustle and bustle of everyday life to a calm green roof where life slows down. We work with the top manufacturers in the world to liven up your indoor environments with a living wall system. Regional Account Manager Andrew Engel speaks to our passion in designing unique environments for each client. Aesthetics are important, but providing earth-friendly planting options are essential. Account Manager extraordinaire Kim Vogel explains the importance of indoor landscapes in office environments. Decades of experience and a large operations team capable of handling projects of any scope. The culture we foster allows us to create truly distinctive work for our clients. Our President, Jack Harris, explains what it takes to stay ahead of the curve. Meet our Senior Designer, Jack Mascharka, as he examines the diverse inspiration that drives our Design Team. From rooftop gardens and pocket parks, to mid-floor terrace greenscapes and lush courtyards, John Mini does it all. Members of the John Mini Team weigh in on what inspires them at work. The iconic architecture of this space provides the ideal inspiration for a naturalistic design. 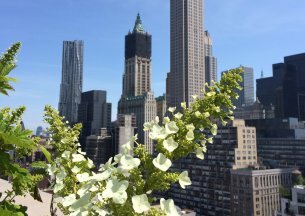 Take a look inside the process of one of our exciting roof top installations in Downtown Manhattan! Here's another peek at one of our exciting roof top installations in Downtown Manhattan! At John Mini, we’re not afraid to color outside the lines. Distinctive holiday decor custom-made for each space. Watch as we create a serene escape from Manhattan as a representation of nearby Central Park. At John Mini Distinctive Landscapes our passion is our profession. We bring nature where people live, work, and play. This National Award Winning garden offers the soothing effects of a walk in the woods in midtown Manhattan.